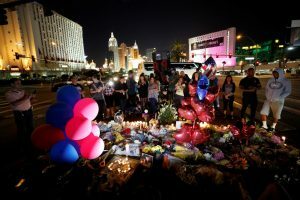 The San Bernardino County District Attorney’s Bureau of Victim Services will host two forums next week for victims of last year’s Route 91 Harvest Festival tragedy. The forums will include a group discussion facilitated by licensed clinical therapists, one-on-one counseling, educational resources, help in navigating one’s own health care services, and assistance with applying for the State of Nevada and California Victim Compensation programs. Services will be provided by the San Bernardino County District Attorney’s Bureau of Victim Services, the San Bernardino County Department of Behavioral Health and The Counseling Team International. All Services are provided free of charge. No insurance is needed. The forums will be held from 5 to 9 p.m. on Wednesday, Oct. 10 in Victorville and on Thursday, Oct. 11 in Ontario. Click here for locations and more details. For more information, please call the Bureau of Victim Services at (909) 382-3846.